One of the Lima Limas flies over Pensacola Beach on Friday. 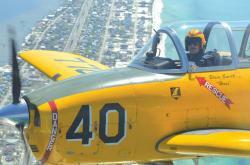 Photos by Mat Pellegrino | Gulf Breeze News Editor’s Note: Two members of the Gulf Breeze News staff were invited to take a ride on a Lima Lima, one of the aircraft that flew during the Pensacola Beach Air Show last week. These are firsthand accounts of the flights by the two staff members Bri Taylor and Mathew Pellegrino. When I step aboard any plane, the Foo Fighters song “Learn to Fly” plays on repeat in the back of my head. I love the thrill, the view and the feeling of being up in the air. My past experiences with planes are very limited. Most are encounters with Boeing 777, packed with dozens of passengers, little leg room and the always constant fight over who will get the most elbow room on the arm rest. While I wasn’t fighting over elbow room aboard the Lima Lima, one of the many planes set to fly in the Pensacola Beach Air Show, I did have the challenge of bringing a 5-lb. camera aboard, and quickly lost my appetite. Passengers inside the Lima Limas get a first-hand look at what the pilots see up front. Why? Because I figured at some point I was going to be reaching for a barf bag. But I soon found out that wasn’t the case. During my flight briefing flight, I was assured this would be a gentle cruise over the clear waters and white sands of Pensacola Beach. I’ve flown into my home town of Washington, D.C. on several occasions, but have never seen Pensacola Beach from up high. Preparing for the flight was easy. I was told to strap in to the plane’s seat and enjoy the ride. The only difference was, there wasn’t a stewardess showing me how to properly restrain my seatbelt. That was the pilot’s job. And there was no emergency exit. The problem was, there were a total of five different straps that went up, over and around my body., probably keeping me from getting up and changing my mind about flying. But once I got situated, it was pretty comfortable. The Lima Limas flew over the beach during the Pensacola Beach Air Show on Friday and Saturday. The take off was smooth. I was in the front of the pack of five with Ltc. Skip Aldous. Plane number 15. Behind me during take off were four other aircraft, two to my left, and two to my right at all times. The take off in the Beech T-34 Mentor was not like a Boeing 777. It was smooth, and didn’t pull me back too much. What did pull me back was once we got in the air, I looked over and could practically touch the plane next to me. While I have flown over Escambia Bay, there’s nothing like seeing the Pensacola Beach Ball water tower and the bird’s eye view of Fort Pickens. The Mentor was the brainchild of Walter Beech, who wanted the airplane to essentially replace North American T-6/SNJ trainer, which was being used to train pilots during World War II. Beech eventually got his wish and the T-34 entered United States Air Force service (T-34A) in 1953 and then Navy service (T-34B) in 1955. With a length of just over 28 feet and a wingspan topping 33 feet, the plane, one of over 2,300 manufactured, flew smoothly through the clear blue skies. But no one should let size fool them. The T-34 is capable of pushing 214 knots, or in layman’s terms, 246 mph. During flight, Ltc. Aldous didn’t pull those speeds, thankfully. He did, however, pull a few quick turns and maneuvers that caught me off guard … and almost knocked me out. Thankfully, I regained my manhood and puckered up to look at the beautiful views of Pensacola Beach and Pensacola in general. As we flew over the beach, I glanced at the white sands, sprinkled with lawn chairs and umbrellas. After a good 30 minutes in the air, Ltc. Aldous let the other pilots in the Lima Lima group head home. But before landing, Aldous wanted to pull one last prank on me. When he pulled wild maneuvers during the flight, he never warned me. That resulted in me grasping for the nearest handle or my chest. And as we approached the landing strip, the sweat on my forehead started to dry. I was sure my own two feet were about to be back on solid ground – that I planned to kiss. But Aldous wasn’t going to let me off that easy. As we approached the runway, he pulled the joystick up hard, causing my eyes to roll up into the back of my head; and then readjusted the plane. I’m sure he got a kick out of it. The Lima Lima crew proved to be a fun-loving group of young men who enjoy the feeling of being high in the skies, and the adrenaline of pulling back on a joystick to scare the hell out of their passengers. 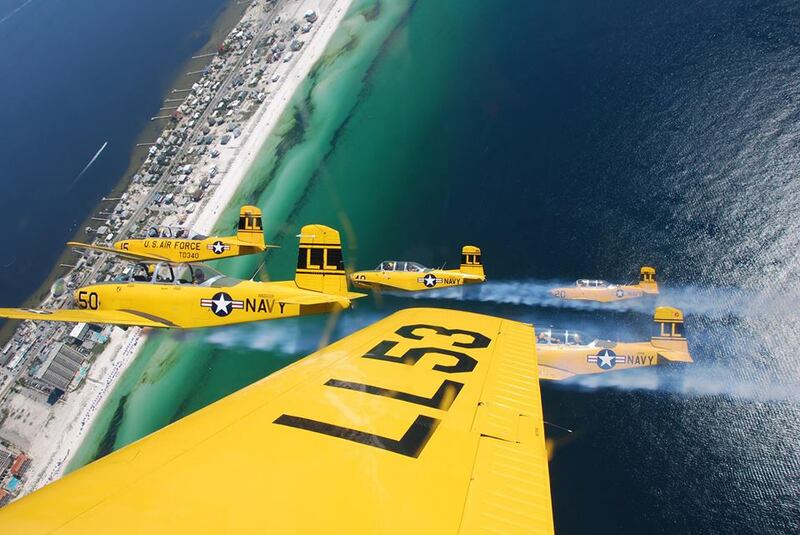 The six Lima Lima’s flew over the white sands of Pensacola Beach on Friday. Despite great weather conditions, thousands less flocked to the air show on Friday and Saturday. Photo by Bri Taylor | Gulf Breeze News Even though the Blues were not soaring over the beach this weekend, many people were thankful for a new set of wings that drew in an estimated 161,688 visitors to the area. Despite the new act, not as many people flocked to the Pensacola Beach over the weekend for the air show. According to Santa Rosa Island Authority Executive Director Buck Lee, traffic was down on Friday and Saturday compared to when the Blues flew in the past. Data obtained by Cheryl Messier, the Administrative Assistant for the Escambia County Public Works Department, Saturday’s numbers were actually up at the toll booth compared to last year. This year, 18,632 vehicles passed through the toll booth on Saturday, as compared to 17,137 people last year. On Sunday, the toll booths saw only 127 fewer vehicles compared to the same time last year. Lee said those reports could have driven away a lot of air show enthusiasts over the weekend. On Saturday, the air show had to be delayed about 30 minutes because of severe weather in Pensacola according to Lee. During the Blue Angels homecoming weekend in years past, Lee said he estimated the beach saw an estimated 150,000 people pass through the toll booth. Beachgoers look on at the aircraft acrobatics act on Saturday on Casino Beach. Photo by Mat Pellegrino | Gulf Breeze News In 2012, an estimated 171,813 passed through the toll booth, while this year, about 161,688 people passed through. But when focusing on the real numbers, that means that only 4,000 fewer vehicles passed through the toll booth this year as compared to the same time last year. When the Blue Angels originally cancelled their show earlier this year, Lee attempted to offer the Navy money to keep them flying over the July 4 weekend. Authorities argued because the Blues’ practice times were also being cut, they were probably not fit to fly in the annual show this year. After the disappointing news, Lee worked to get another air show to the area. Lee said SRIA budgeted $150,000 for the air show. That included the concert, additional sheriff’s deputies, a reception for the sponsors and hotel rooms for all of the pilots in Pensacola. Lee said SRIA probably spent just a little over $100,000 over the weekend. If SRIA had not found a replacement for the Blues, the area could have taken a $2.4 million loss in revenue. Those statistics came from The HAAS Center in Pensacola. The SRIA executive director said most air shows like this charge viewers to watch the show. Lee said SRIA really looked at the impact the show had on the local businesses. On Monday, Lee said he had spoken with a few businesses that said the weekend was just as good as any other Blues weekend. “I did talk to Capt’n Fun’s, and they were saying this (past) Saturday was just as good as any other Blue Angels Saturday,” Lee said. “The RV park only had half a dozen spots available (too). During the air show, Lee said he had people come up to him and thank him for keeping the air show going, even though it wasn’t the Blues in the skies. “People that would come up to me that knew me out of the blue said ‘thank you for doing this, thank you for doing this.’ I don’t know how many people came up to me and said that,” Lee said. The view from the back seat as John “ripper” Rippinger prepares for takeoff in his Lima Lima on Friday. Photo by Bri Taylor | Gulf Breeze News With the Blue Angels grounded for the 2013 Pensacola Beach Air Show, locals and annual visitors were anxious about the new set of birds that would take to the sky. Twenty-four planes were scheduled to fly high above the sugar white sands and “Lima Lima,” an acrobatic flight crew, were the stars of this year’s show. I was privileged to experience the talents of the flight crew firsthand Friday during their pre-air show fly over. Upon arrival, I was laughed out of the Pensacola Aviation Center when I strutted in with open-toed heels. Luckily, I was prepared to choose from 15 other pairs of from my SUV. After returning with sneakers, I and the other passengers signed a waiver and placed cold packs of “Black Ice,” around our necks to keep cool in the 120-degree cockpit during flight. The Lima Lima group flies over Escambia Bay before the air show on Friday. Photo by Mat Pellegrino | Gulf Breeze News We greeted each of our pilots and heard a safety briefing which included instructions on where to place a life vest, parachute and what do just in case something went wrong. My delightfully seasoned pilot, John “Ripper” Rippinger said, “If I say it’s time to get out, it isn’t a joke, you grab the handle, open the hatch and undo your harness, got it?” I replied quickly, “You don’t have to tell me twice boss, I’ve never jumped out of a plane before, but I am a quick learner.” After I suited up I did not hesitate to jump in the yellow T-34 Mentor cockpit. My headphones were on and I could hear pilot lingo transmitted between the flight crew. There was also a two-way communication system wired so that the pilot can speak directly with their rear passenger. “This is going to be the most fun you’ve ever had without having to take your clothes off,” Ripper said. I almost bent over in laughter until my harness pulled me right back against my seat. I pressed my audio exchange button and replied, “I don’t know Ripper, I went to college in New Orleans, and I’ll have to be the judge of that!” I noticed his grin lines form on the outside of his eyes in the tiny round mirror used to check on the passengers during flight. We sped down the runway and six planes gathered into formation. Ripper’s plane was number 53 and sixth in formation. We flew high above Pensacola and headed toward the coast. It was breathtaking. After two weeks of flood flashes and afternoon downpours, the skies cleared. We approached the coast and I saw that the parking lot of Casino Beach was already half full at 10 a.m. I was busy taking pictures and admiring the landscape when I noticed two of the planes had disappeared from formation. “Are you ready back there, Bri?” Ripper asked. “Ready as I’ll ever be!” I replied as I watched plane three shoot up and backwards away from formation. Plane four…plane five… “WHAAAA- HOOOOOO!” I screamed out loud and was the only one who could hear it. It was like riding a roller coaster, but on a much grander scale. As they rejoined formation they released smoke trails to give early beach-goers a preview of the afternoon show. I had a flash back to every summer I spent at the edge of the water with other screaming fans as the Blues roared by at deafening speeds. 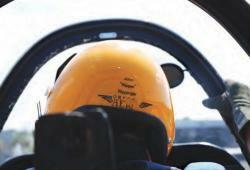 I realized that with this profession, it’s the pilot, his plane and his team. As we touched down on the runway and I was literally and figuratively grounded. I gave my pilot a sweaty hug and snapped a few final pictures. As I made my way back to the office, I experienced a moment of clarity. The Blue Angels were not flying high along the coast in their solitary cockpit this year, but while suspended from the sky they saw the outpour of support on the ground. The Lima Lima Flight Team understood that they had big shoes to fill. Their mission was to spend hours perfecting their stuntfilled shows to give Pensacola Beach locals and visitors a weekend they would remember the rest of their lives… starting with six passengers who wanted to go for a ride. I was saddened by the absence of the Blue Angels this summer but I was honored to meet the Lima Lima Flight Team who brightened our clear blue sky with six yellow birds. This crew entered a town where aviation is the lifeblood of the economy, took the tough challenge, and ultimately met high expectations. Pensacola Lima Lima, “Lords of the Sky,” were anything but disappointing!